Basically, this product is supposed to help reduce hair loss and help give new birth to hair follicles in their production of hair – working from the inside out. Of course, the suggested treatment/dosage period is at least 3 – 6 months to see a noticeable difference. 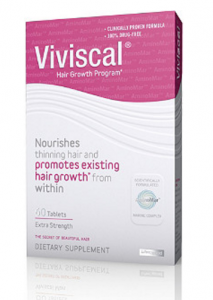 Who is Viviscal Hair Growth Dietary Supplement For? This dietary supplement is aimed at women and men of all ages. Initially when this product came into being, it was more geared towards women. Just recently, they now have the men’s dietary supplement. It targets hair loss and thining hair customers. I get the feeling that if you have no hair issues, then you might not want to use it as a supplement, based on most of the reviews I have read. There is a customer service support available 24/7 to help with product questions,hair advice, hair styling and tips. There is also email support as well as a blog. This product can be purchased on Amazon – VIVISCAL HAIR SUPPLEMENTS You can purchase the supplement in 60 – 120 tablets dosage. As a hair growth supplement, based on the reviews and the company supplied information, I would be interested in purchasing this product – especially if I had issues with hair thinning or hair loss. Obviously, I would also have to be patient in order to see the product do its job. I am very impressed with the clinical studies and the ‘age’/experience of the company – 25 yrs of experience.